A Year of Troubles in Rugby? … Still Better Than Soccer! A year of self-inflicted purgatory for rugby. [Rugby] can also be proud of the fact that it remains the case that parents were able to watch games with their children, of any age, without witnessing xenophobic, homophobic and racist abuse. When record crowds watched the game, they did not see any player swear at an official. No group of players surrounded the officials and no manager berated the assistant referees. If any parent decides to let their offspring try out rugby they will be able to go to one of hundreds of clubs that efficiently organise weekend rugby. The children will compete without the attention of abusive parents. There will be no need for a roped area between the touchline and the supporters and the referee will not have any decision contested. Yes, rugby has had serious issues to face and those problems should not go unacknowledged. However, it did not deserve the overly savage and self-serving criticism of the football-dominated media during 2009. Intent on exacting revenge for what it saw as years of perceived hectoring from the oval-ball game, every derogatory word imaginable was used to portray rugby as a sport akin to bear-baiting. However unpalatable, the ”Bloodgate” scandal – in which players faked blood injuries to allow for tactical substitutions – did show the contrast between football’s hand-wringing over things such as Thierry Henry’s handball in the World Cup qualifier against the Republic of Ireland and rugby’s will to deal with its problems rather than whinge about them. When football can stage an event featuring four London clubs at Wembley with no segregation of fans, with freely available alcohol in the ground and a minimal police presence – that’s when we might start listening to moral lecturing from the round-ball game. Two Hands on the Ball! As coaches, we’ve probably demanded this of our players at one time or another, or all the time! There are obvious advantages to tucking the ball under one arm and keeping the other free – fending off, sprinting away – but absolutely keeping that ball in two hands provides so many more opportunities. We all know this, we all say it, but sometimes I think we don’t realise HOW important to attackers, and threatening to defenders, this can be until we see it put into effect with fantastic results. Keeping the ball in two hands provides the ball carrier with the instant ability to make a pass to either side. We’ve all stresed this – even the second or two it takes to transfer the ball from one to two hands to make a decent pass can be crucial in keeping the attack moving. Some players have developed the ability to make split second one-handed offloads, but they’re often not as accurate had they been made with two. From contact, I love this little pass flip – when done well. Too often, though, you see that one handed attempt go forward in contact or at least not find its target and slow down the attack, if not waste it altogether with a turnover. Making the offload in contact with two hands can present a potentially risky scenario to the ball carrier, who needs to keep his/her arms free to make a decent pass. This often exposes the torso to a big hit, so the ball carrier will have to get into a strong and safe position to do this without getting crunched. In many cases, this means turning sideways, and eliminating forward momentum should the opportunity for a dummy and go present itself. I don’t think it’s a bad thing, as we should aim to keep the attack moving in any way possible. But as with other areas (like the tackle) discussed earlier, and to come, I think as we teach / learn something new, we ignore the benefits the “good ‘ol tried and tested” techniques offer. They’re still considered “gold ‘ol” for a reason! As such, I stress that running with the ball in two hands not only provides the attacker with the opportunity to pass quickly in any direction but – I’d arguely more importantly – causes unsurity in the mind of defenders. With a ball tucked in one hand, even with the fend arm facing you, a defender pretty much knows that you’re going to be moving away and are ready to accept contact. With the ball in two hands, realising your body is often square to the goal line and with the ability to pass anywhere, the defender has to be significantly more cautious. If you look for this when you’re watching a game next time, you’ll notice how the defenders are forced to hesitate as they’re not quite sure what will happen. We know how carrying the ball as such saves crucial seconds in making the pass, but that dynamic potential also causes defenders to hesitate for crucial seconds which buys the attacker even more time to think and act! In quite a few incidents, you’ll also wonder (esp. if it’s your team defending!) how the defenders happen to let the ball carrier just keep running like that. Obviously threatening in situations where the attackers have more numbers, ball carriers can also use the two-handed “dummy pass” to get through when faced with equal defenders. This is really the fault of poor communication and trust among defenders, but directly the result of the ball being in two hands. (I’ve even read about one instance where a player dummied the fullback with NO supporting players near him, because the two-handed fake was that good!) A good fake isn’t even necessary at times, when the options the attacking player has are so great that the defender panics and attempts to predict what will happen – as Van Gisbergen (15) does in the first clip. In any case, running with the ball in two hands provides more options and can really cause defenders to become overly cautious, if not sheer panic. Notice in these two clips how seasoned professionals are made to look like rookies all because the ball carrier created uncertainty with the two-handed carry. These things considered, practiced, and perfected make easier my desire to see players pass BEFORE contact (and thus remain on their feet to get the ball later) more possible and beneficial. *I think my next chat should be about communication and trust on regular and cover defence, and my frustrations with the ‘jockey’ defence. A good ball-in-two hands run can be lethal, but it shouldn’t be if defenders have themselves well organised. I don’t think it’ll surprise you to learn that I attended a rugby movie as soon as I was able … okay, I resisted seeing Forever Strong until housemates sat me down and saw me cringe at what a … sorry, I digress. I didn’t get to the first showing at noon, as I was attending the last lecture of a librarian (Walter Zimmerman) who is revered by generations of Western staff and students. I mention this because I felt it interesting, and emotionally inspiring, to witness the legacy of two great men in one afternoon. Invictus is not so much a ‘rugby movie’ as it is a ‘Mandela movie’ with a whole lot of rugby thrown in. I went in the afternoon, and it was full of seniors. For some reason, I thought this would only attract the rugby and sporty types, but it was good to see them there. Maybe they wanted to see something about Mandela, having probably remembered more about that period than I? (Thy cynic in me also knows that most films on offer at any time of year are crap and meant for the youth and/or undiscerning market.) From what I’ve read about Mandela, Freeman seems to have got it spot on – and it’s not the first time he’s had to do the accent (Power of One) – but the mannerisms seem to be there as well. Those were the moving parts for me – how ‘Madiba’ treated people and how he saw the bigger picture and value of symbolism, like truth and reconciliation over revenge. His interactions with his staff were some of my favourite parts of the film. You get a sense of the immense pressure he was under, and how much work he was doing to steer the country right, but kept seeing this little rugby tournament as one important – however small compared to all the diplomatic stuff – ‘calculation’ within his plan to unite the country. What impressed me was the balance of drama and action. Just enough sport, just enough politics to keep all happy. The dramatic scenes were excellent and provided several angles, and the rugby was very good (surprisingly!). There were no elments which would make true rugby people question the authenticity … though I might have spotted the odd technique / tactic which wasn’t in use back in 1995 😉 . They even went to great lengths to have the players look like the actual players who were there, and not just from the Boks, but also the other teams. Former Bath backrower Zak Feaunati played Lomu, and sort of looked like the older Lomu (Jonah was a lot skinnier in 1995). Even in the really short scenes, I noticed a puffy haired ginger for Australia diving in for a try who looked very much like Lynagh! Apparently former Tongan international Epi Taione was in it, and Bok winger (and character in the film, as he played wing) Chester Williams was a coaching consultant. My only criticism comes from the ‘film buff’ and ‘English teacher’ sides of me. Another half hour of character building would have made it perfect. I already said Mandela was protrayed well, and the buildup of drama was great, but I wanted to hear more from the supporting cast. The interactions between the body guards was great, but a tiny bit more about their backgrounds would have built the story better. They only touch upon them being former ANC fighters and Special Branch – direct enemies who likely had killed each other years ago – but I don’t think people who don’t already know the history of Apartheid would know how truly significant that was. I also wanted to hear more of Pienaar’s thoughts. Damon does a great job, but I was left thinking that his lines only moved the plot along, and didn’t offer any insight as to what Pienaar was going through and thinking about regarding the transition and their role as symbols at that time. His one momemt comes after visiting Robben Island, but I’d like to have heard how he dealt with being captain and the feelings of his teammates. (Oh, and if they’d replaced the Samoa scuffle with the Canuck brawl that’d be perfect! 😉 ). I’m in the final stages of transferring my old rugby videos to dvd, and I guess have been going ‘backwards’ somewhat as I’m now at the 2000 NPC final, between Canterbury and Wellington. They have to be the most unspectacular yet incredibly efficient teams in rugby, if not sport! I won’t go on about their successes at both provincial and Super level, as any in-tune rugby fan knows what they’ve done over the last 10 years, at least. I suspect I never really followed / appreciated them as a fan, because I liked the flair in rugby, which probably makes sense that I’ve set myself up as such as a plastic JAFA. And it’s not that they play boring, 10-man and/or defensive rugby either. They score tries, and some nice tries, too, but there’s not really any flash about it. And that’s why I have to doff my hat and finally give them the respect their due … I’m waiting a moment, as I’m sure my rugby network will implode right now … we’ll see. Anyway, just looking at these two sides in this final, anyone who didn’t know better would look at the two lineups and back Wellington. Even today, if you didn’t know who McCaw or Carter were, you’d probably back their opponents either. Even concerning those two, I think I’d even dare to call them ‘unspectactular.’ Richie’s no Victor Vito, and Dan’s no Carlos Spencer, but those two are also no McCaw or Carter! One gets amazing turnovers and seems to be invisible to referees, and the other has this ‘trot’ which, to me at least, often makes it look like he’s having a jog in the park. But they’re bloody good, aren’t they? And the same goes for their compatriots in the red and black. They’re bloody efficient at this game despite any lack of size, speed, and flair they might have (or appear to have, when comparing team sheets) compared to other provinces and clubs in other nations. When I first watched this particular game, I’d look at players like Ralph, Macdonald, Blair, Mayerhofler, Thorne, Robertson, Broomhall, and Gibson and back their opponents to give them a proverbial manshaming. Even if you showed a non-rugby fan pictures of Blackadder, Mehrtens and Marshall, they’d probably laugh if you said they were among the best in the world at this game. … and you’d probably make them think rugby was pretty easy that these average Joes were at the pinnacle of the sport. But these guys were bloody good at what they did, and I think is a testament to show how dynamic rugby can, and should, be. You don’t have to be as big as an American footballer, tall as a basketball player, as intense as a Canadian hockey player, or as flashy as a Brazilian soccer player. Any person of any size with a brain and a certain degree of fitness can learn to play the game with a high degree of skill. 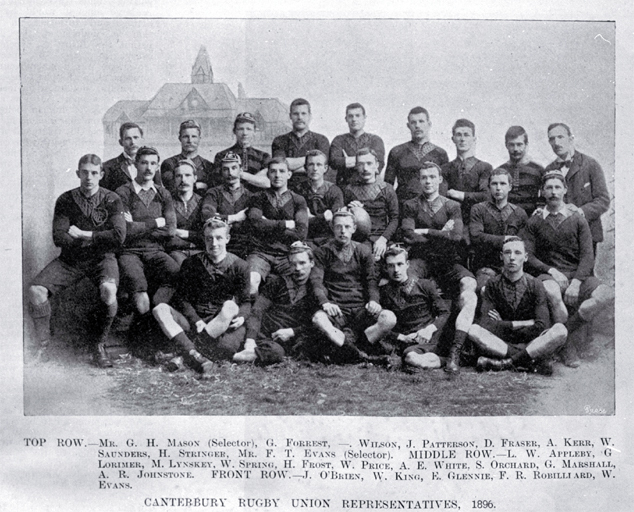 As such, I think Canterbury’s continual success with their breed of extraordinary ‘ordinary’ players should be a lesson that the game doesn’t need changing to become a spectacle. Those who do it well most often aren’t that flashy, but are calculating, dynamic, efficient and supportive. Turn those into a set of personal values and they’re amazing things for people to have. But as some people seemingly want to popularise rugby, alter its Laws for the sake of viewership and heap more celebrity status on its young athletes – and thus make it more of a show for the masses – I hope they take a step back and realise that they run the risk of changing what is truly noble and wonderful about rugby.